On February 10, 2019, Gayle Vivian Stahl went home to be with the Lord and to join her father, (Herman Frieswyk) and mother (Miriam). Gayle is survived by her older sisters, Carole Newport (Charles) and Lois Richardson (James Gould, Fay Richardson). Preceding her passing was her younger sister, Faye Hudgens. Gayle leaves behind three daughters, Rebecca Roberts (Mark), Jill Gabel (Glen), and Elizabeth Stahl. Gayle also leaves behind five grandchildren, Andrew, Jacob and Rachel Roberts, and Marissa and Claire Gabel. Gayle also leaves behind one great-granddaughter, Wandajune, daughter of Andrew and Bridgette Roberts. She will be greatly missed by her numerous nieces and nephews, as well. Gayle was an active member of her community, having resided in Brighton Township since 1974. 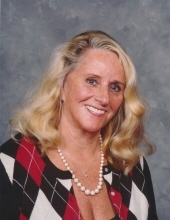 She was an active member of the Hartland Jaycee’s, owned a variety of small businesses in the Hartland/Brighton area, and served the Brighton School District as well. She attended Highland Park Baptist Church her entire life, where she was a member and regularly attended services. Her effervescent personality and boundless energy will be sorely missed by all those who knew her through the community and church, but especially by the members of her family to whom she modeled the virtues of hard work, loyalty, and a strong faith in Christ. Visitation will be held at Lynch & Sons Funeral Home, 600 E. Main St., Brighton, MI 48116 on Friday, February 15th, 2018 from 4 - 8pm. Funeral Service at Highland Park Baptist Church, 28600 Lahser Rd. Southfield, 48034, on Saturday, February 16th, 2019 at 11 AM with gathering beginning at 10AM. "Email Address" would like to share the life celebration of Gayle Vivian Stahl. Click on the "link" to go to share a favorite memory or leave a condolence message for the family.